Home » Geek Adventure » It’ll take more than that to scare a Glaswegian baby! It’ll take more than that to scare a Glaswegian baby! After a year of traveling hundreds of miles to cross things off the list, I was in for a treat. 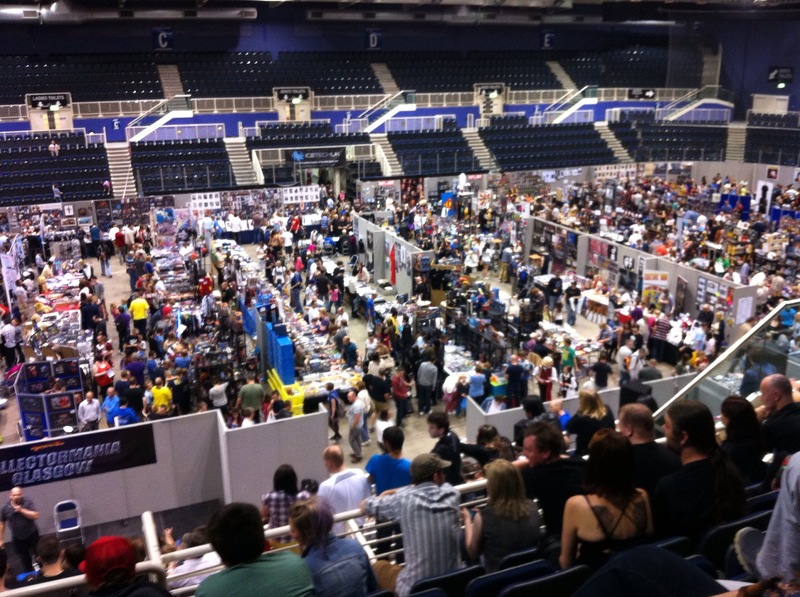 Collectormania is a convention that travels around the country taking in Milton Keynes, Glasgow, Manchester and Cardiff. After months of waiting it was finally hitting Glasgow, which meant that I could just jump in the car and be there in twenty minutes. No 5-hour road trips, having a coronary at fuel prices or arguing with the satnav. It seemed very strange to be parking up in our local shopping centre car park but the event was being held in the arena that adjoined it. Normally, the city’s ice hockey team played there but on this weekend it would be full of nerds and geeks. Walking through the shopping centre it was easy to distinguish which ones were headed to the event. Apart from the cosplayers, there was an overabundance of geeky t-shirts and it was fun spotting them. When we got to the arena door and saw the queue, Husbands face sank. ‘I know! If only I had bought tickets beforehand.’ I said as I fished out two tickets from my bag and waved them triumphantly around. If the past year of attending conventions had taught me anything, it was to be prepared. That could mean anything from buying the earlybird tickets to avoid queues, always having a bottle of water in your bag as it can get HOT in there, making sure you know where the toilets are to having enough cash on you as a lot of stalls can’t take cards and scoping out where the best food places are. It was great to be able to get in without having to stand in the queue but as we walked in we were met with a wall of people. It was mobbed, absolutely bursting at the seams. Families, couples, groups of friends, all with huge smiles on their faces as they indulged in their passions. I was on a mission though, a mission to meet and get my photo taken with one of the best villains that has ever been committed to celluloid. The villain that is FREDDY KRUEGER! Joining the queue for the photo shoot, I was ushered into a room where the queue snaked around the edges towards the photo area. I panicked slightly, usually these photoshoots are done behind a screen of some kind so you really only see the person in front of you getting their photo taken. But this meant that everyone in the room would see the awkward hello, the shuffling set-up and then the pose before thanking, waving and walking away. 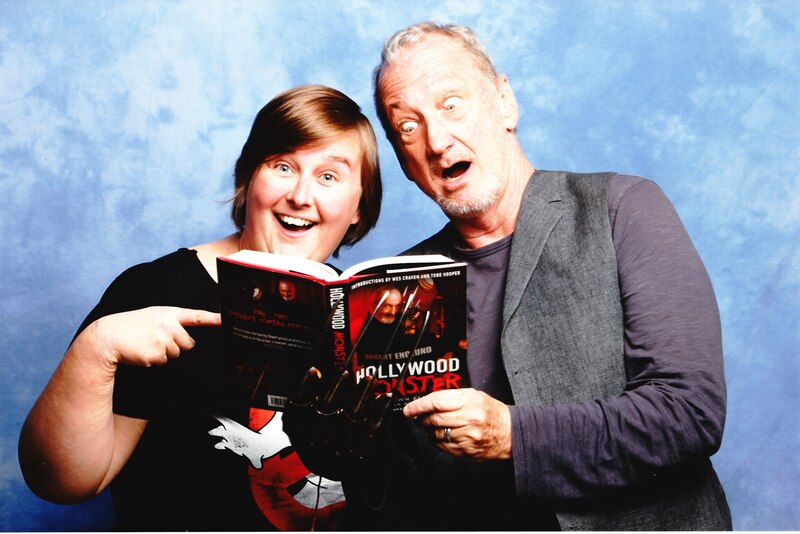 I didn’t have too much time to think about that before Robert Englund walked in the room. I glanced around and everyone had the same big goofy grin as I did on their faces. It was him! Freddy Krueger himself! He was a very handsome chap and looked like a well-to-do English gent rather than the stuff of nightmares. He took a few minutes to talk to the photographer, asking about the set up and then reached into his bag and pulled out a glove. Not just any glove, THE Freddy glove. Leather with knives attached to each finger, he pulled it on with practiced ease. Around the room, the mutterings got louder as the knives ‘chinked’ against his hand. He took his place and the queue started to move. As it turned out, being able to see other people get their photos taken was a good thing as you had something to look at while waiting and it made the room feel like a community. 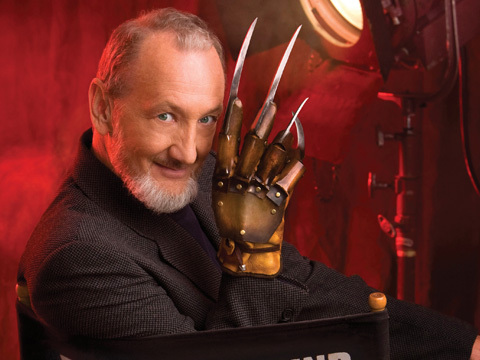 Robert Englund was a pro, not striking the same pose with every person but doing different things each time. Some people were strangled, some people had the glove creeping up over their shoulders. Those who had gone the whole hog and brought their own Freddy gloves were treated to linking hands with the man himself. It was brilliant to see the thought that he put into each pose, each person knowing that their photo would be slightly different from the one that came before them. It made it feel more special than just seeing other pictures of people who had been at the same photoshoot as you and the poses are all exactly the same. Holding his book in the gloved hand, the photo was quickly taken. Thank yous were hurriedly given and then it was off to pick up my photo. The legend that is Robert Englund! A few places after me there were a couple with a young child, probably no more than six months old. Upon seeing this, Robert put his gloved hand down at one side and stood more somberly. ‘It’s OK, the glove won’t scare her’ the mum said. With that he brought the glove up and pointed a finger at the adorable baby. For a split second, she stared at the knife, then at Roberts face and let out a peal of laughter, like only a baby can. The whole room laughed along and the Mum and Dad looked delighted that their child had laughed in the face of one of the scariest monsters ever to be in film. That’s what I love about these photoshoots. You are creating a memory. You may only meet that person for a few minutes but next time you see one of the movies or they are mentioned in the news. you can nudge the person next to you and say ‘I’ve met them.’ Then cast your mind back to the day you saw a six month old baby laugh in the face of Freddy Krueger.